What I understand and believe is that bacteria, virus's, fungus, etc. cannot grow in the presence of ionic silver. This is my firm belief after everything I have researched and read on the subject. Ionic silver is not harmful to humans. It is natures antibiotic/cleanser. TPTB have hidden this from humanity because there is no profit if we stay healthy and out of the medical/pharma system. When you know this to be true the picture is so clear. We have the power to heal ourselves. I keep small bottles of this stuff all over. Spray, sublingual, via nebulizer, etc. I make it and pour it into different bottles. I'm not that technical though as far as the concentration, etc. Your product sounds great and I'm actually going to order some. Comments for I believe in ionic silver!! 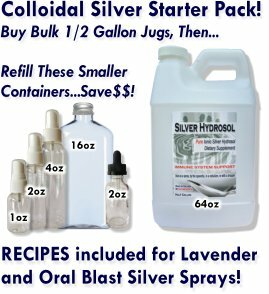 Be sure to try our Lavender Silver Hydrosol spray! We are now offering it in a half gallon refill jug. So many uses for it!